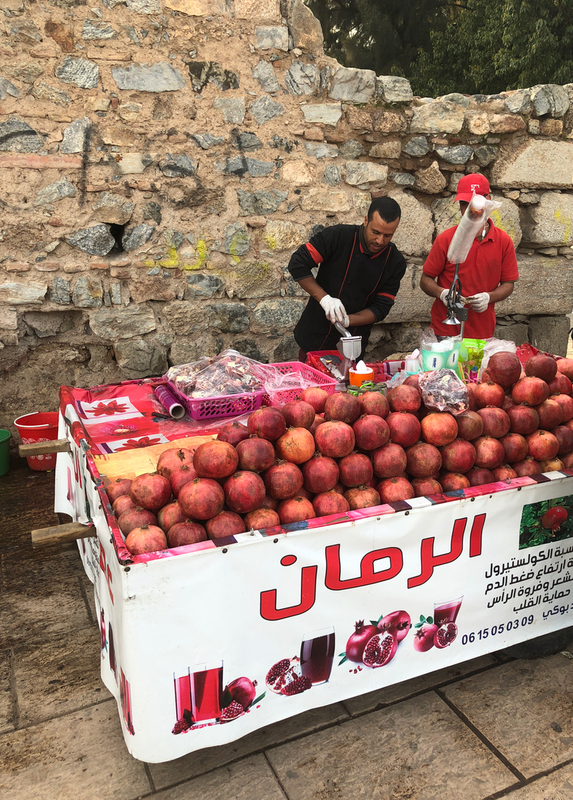 In the cultural hub of Morocco tradition claps to the millennial preferences as many restaurants in Marrakech are self-sustaining, sourcing either from their backyard or their own farms in the countryside. 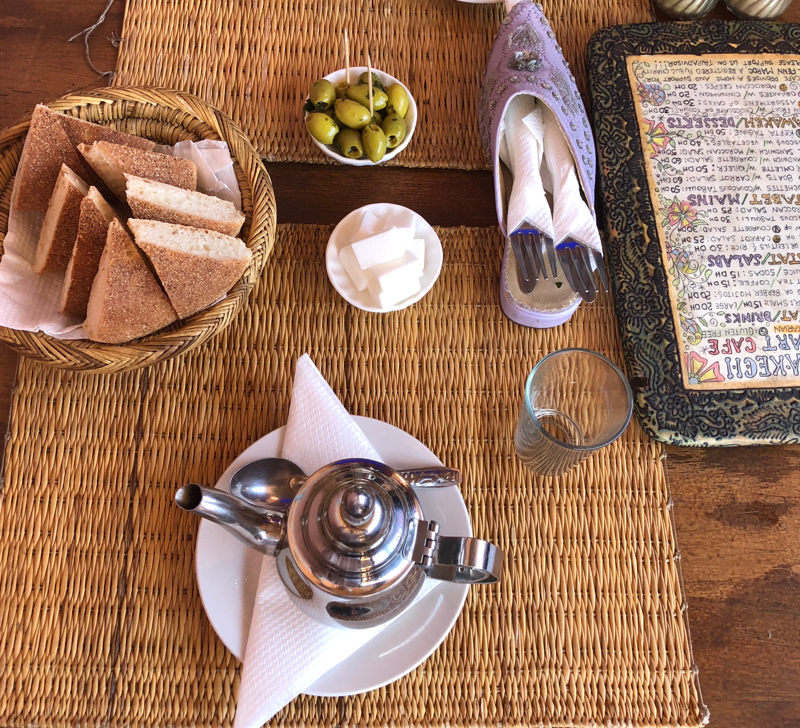 The gourmet pursuits in Morocco stretch well beyond couscous, tajine and Moroccan mint tea. 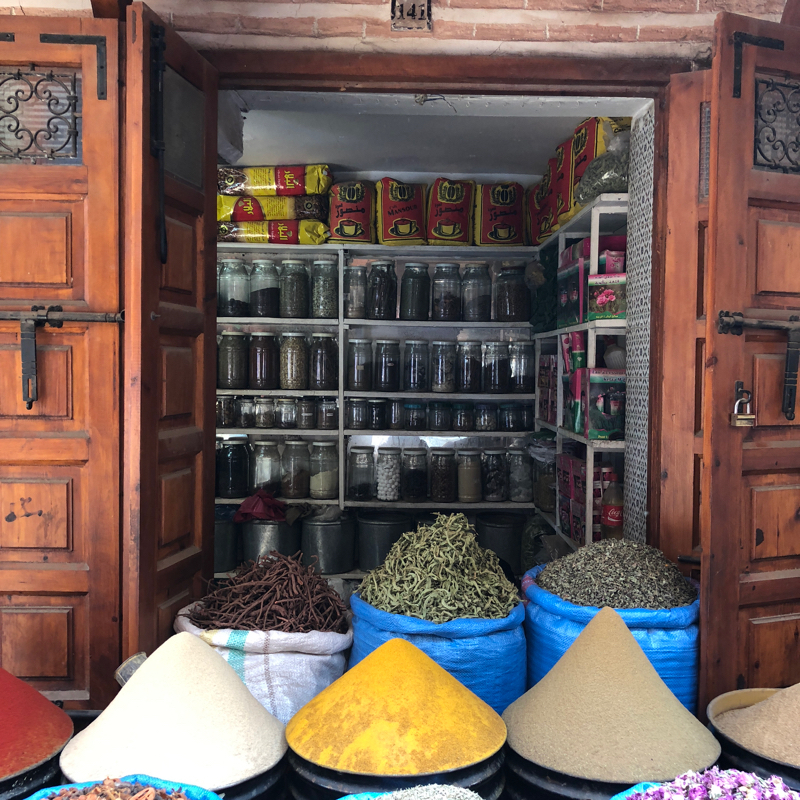 During my recent trip to Marrakech, I savoured the best of Moroccan cuisine and sniffed on its fragrant potential. 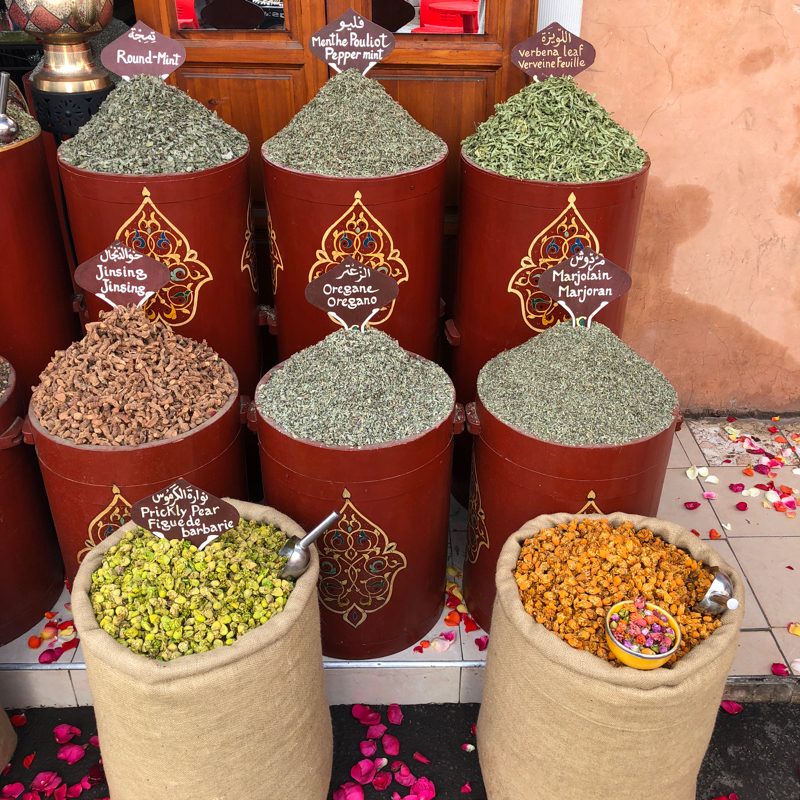 Some of the local traditional ingredient combinations would deserve more contemporary renderings and I could muse on the possibilities in a book-length recipe compendium, but as a restaurant critic, here I am focused on the culinary offerings in Marrakech. The current Moroccan cuisine grew from the spores of native Berber tribes living in the Atlas ridges and the unforgiving Sahara. Early Jewish settlements infused the markets with new ingedients. Later, Arab, French, Ottoman, Persian, Roman and Spanish aggressors and trade influencers cross-bread the local ingredients to yield the rich and complex cuisine of today’s Morocco. For breakfast, a healthier version of Nutella, amlou is spread over the round brown flatbread (khobz) or harcha (pan-fried yellow semolina flatbread). 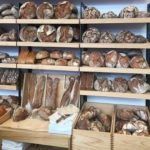 Usually baked or pan-fried by ladies on open, simple griddles, the fresh bread infuses the busy Marrakech streets every morning. Kneeded from the starter made of semolina, water and garlic (Berber style), the flatbreads can be round or square, made from whole or refined wheat but also barley. The best amlou is made at the breakfast at the luxurious Royal Mansour hotel. I tried many local brands of this almond paste with argan oil sweetened traditionally with honey, so I have a good perspective, but do not buy it inside the airport since everything there is prohibitively, up to ten-fold priced! 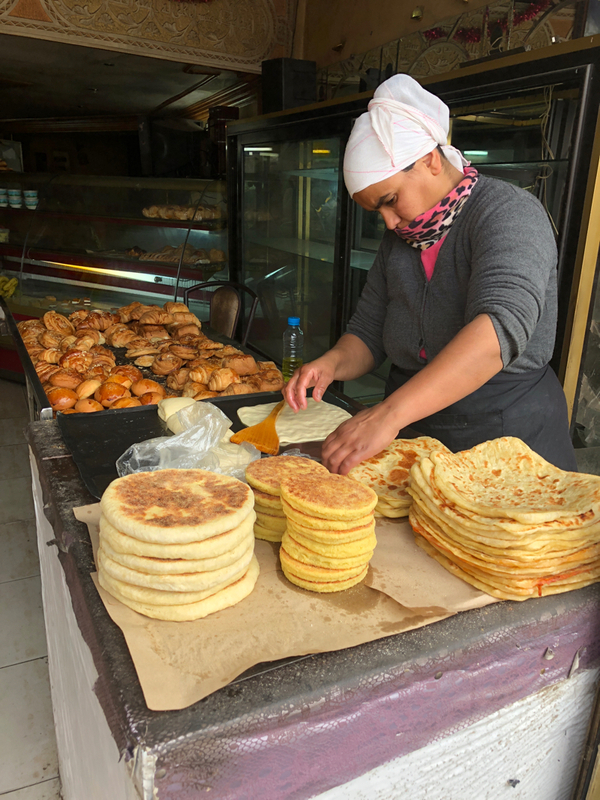 Bubbly pancakes known as beghrir served with honey or syrup made from melted butter and honey, as well as the more laborious square-shaped msemen (rghaif) or the snail-round meloui tune the day to a sweet tone. 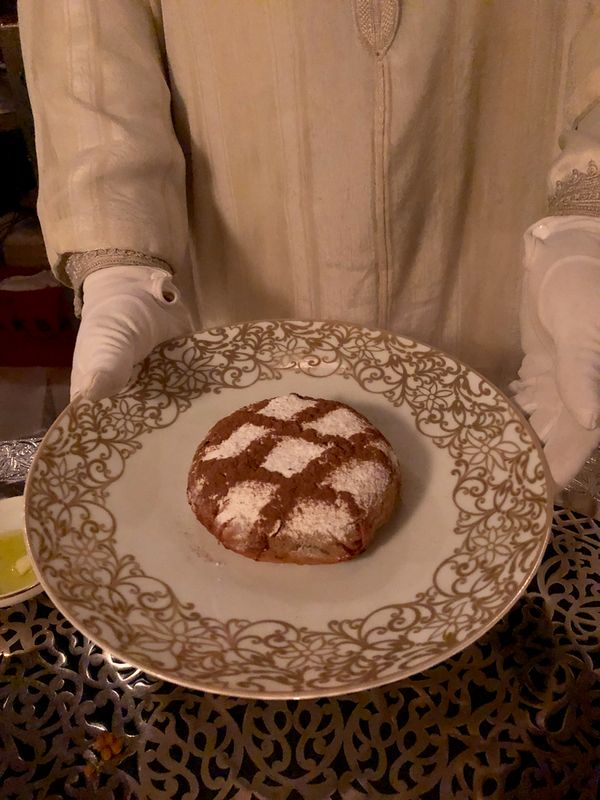 For a snack or light lunch the sweet, cinnamon scented almond and pigeon pastilla (bastilla) pastry [above on the left] sates the intrepid artisans crafting furniture, lamps, sewing kaftans or weaving wool carpets. Allegedly, the pigeons are specifically bred for consumption, but seeing those city birds defecating all over the city, I could not shred my concerns, so I had it once. To my relief, chicken, seafood and vegetarian stuffings do exist. Triangle shaped deep fried briouats are stuffed with cheese and spinach or with sweet almond paste scented with orange flower water, all dipped in honey for the perfect tea companionship. 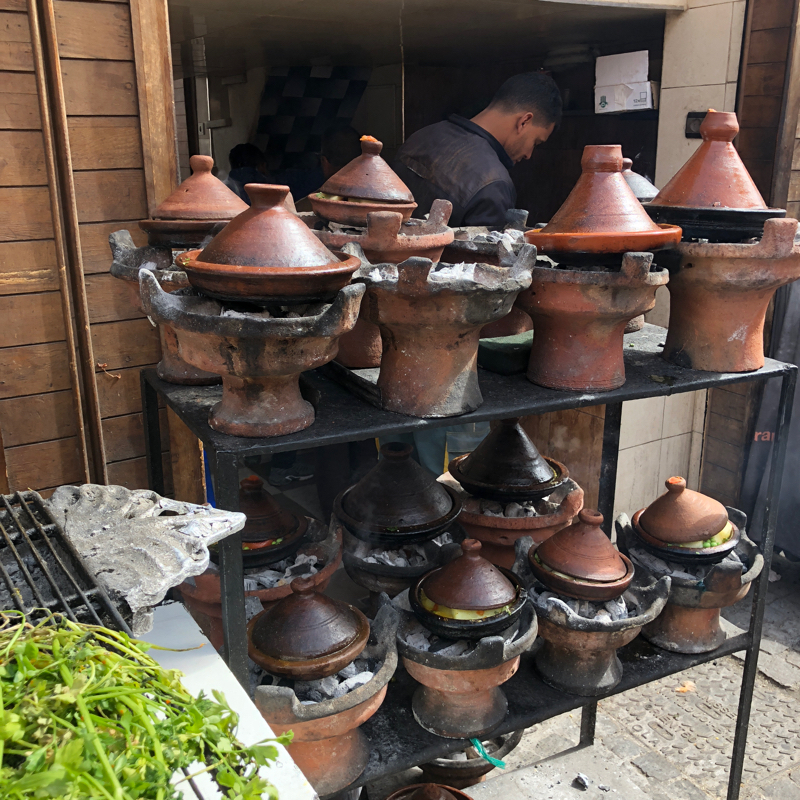 Most Moroccans get their lunch at the streets-lining tajine (tagine) stands. 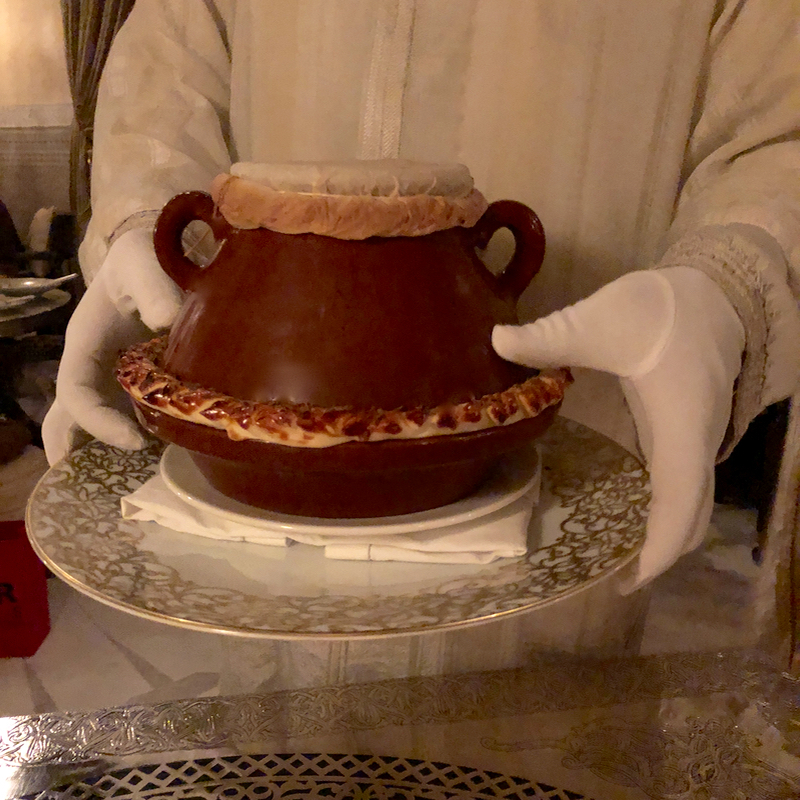 The wholesomely warm spice stew of lamb or poultry for hours cooked over charcoal in a conically lidded claypot is a must-try emblem of the Moroccan cuisine. Usually eaten with bread, the flat disc dusted with semolina, it is a substantial meal. Vegetarian versions are widely available (often overcooked carrots, potatoes, tomatoes, chickpeas or green peas), but rarely great. Slow, wet cooking is not a flattering preparation of vegetables as there are no muscles or tendons to be softened, it all just becomes mushy. Gas cooking is more common in most households and at local cooking schools today. Marrakechi classic tanjia is a slow roasted spiced mutton that is less saucy. Couscous, usually cracked from durum wheat, but also from barley, corn or millet is served either as a side dish, plain or with raisins, herbs, olive oil, as well as mixed with vegetables. As much as couscous is known abroad, semolina flour (rough whole-wheat) bread is the staple at Moroccan homes. 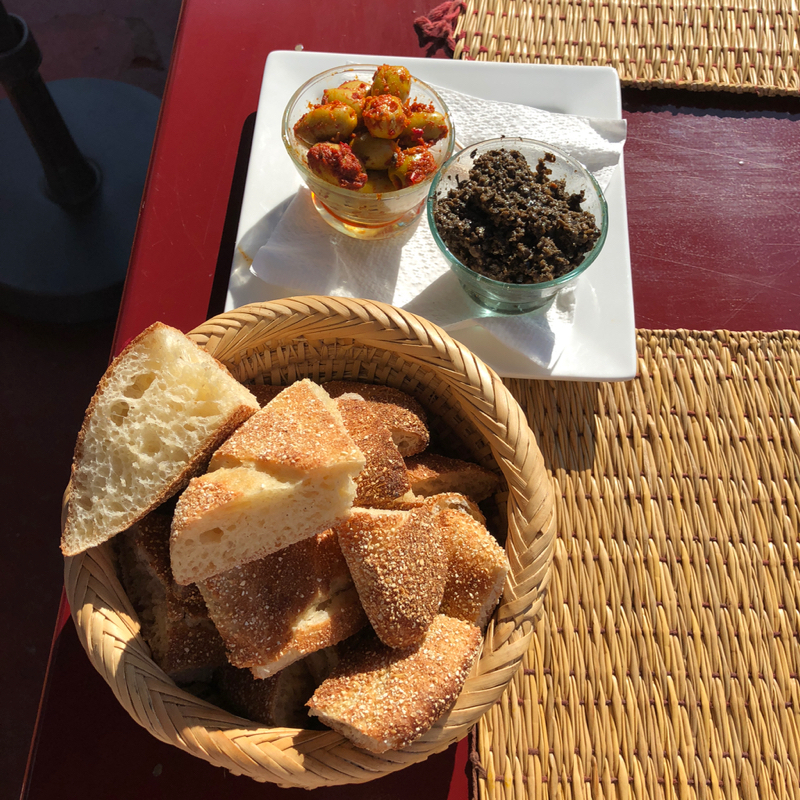 Juicy preserved olives, olive tapenade and olive oil are usually served with Moroccan flatbread at restaurants. Mornings are best chance to get the freshest piece. 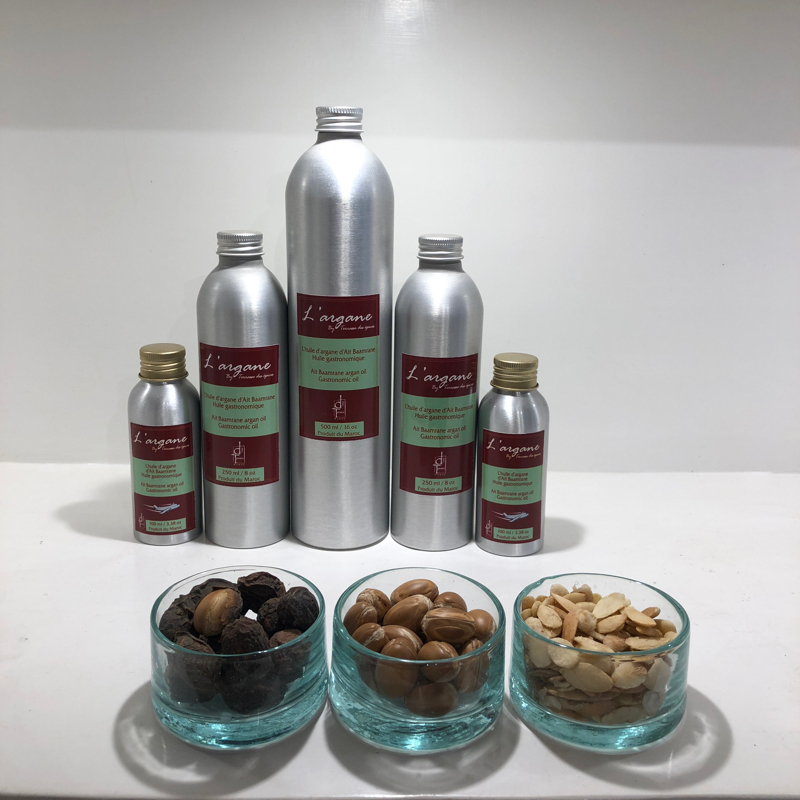 Olive oil is more commonly used that the premium priced argan oil, that is roasted for culinary purpose and extra virgin only in cosmetics. Its pungent, sheep milk scent is not for every palate. It is skilfully hand-pressed, yielding such small amounts of the oil, sky-rocketing the price. 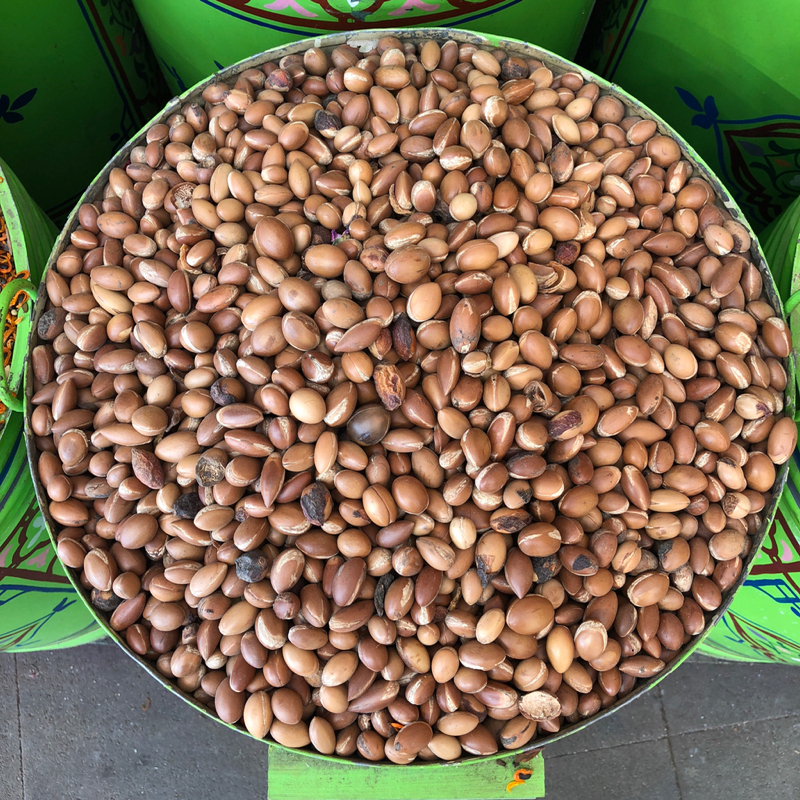 If you are buying argan oil, beware as the quality can be fraudulent. Buy from reputed brands such as L’Argagne by Terrace des Epices or Terroirs Marroc. They also make an excellent amlou spread sweetened with local honey. At restaurants or during house feasts an assortment of Moroccan salads follow after bread and olives are served. Cooked or preserved raw okra, eggplants, sweet shredded or by harissa seasoned coins of carrots, orange scented cucumber slivers, raw radishes, red beets with lemon vinaigrette, string beans, boiled potato salad, khaki green Puy lentils with herbs, seasoned chickpeas, in oil-preserved tomatoes, beans and other seasonal vegetable-based nibbles, are excellent to share for curious foodies eager to sample the local culinary diversity. Every housewife and restaurant has their own recipes, so try them at different places. Orange flower water is used to flavour most of them, but also scents the meat stews and pastry. For special occasions, preserved lemon scented cockerel or chicken is served, prunes are added to lamb tajines, while saffron luxuriates the Moroccan tea. 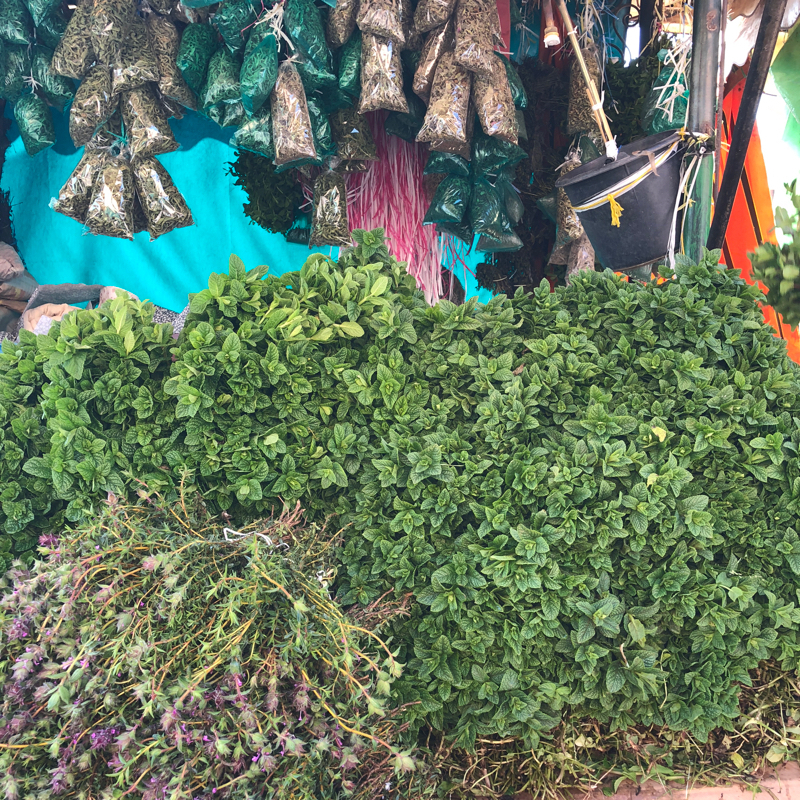 Herbs like the pungent, fresh local mint as much as sage, thyme, marjoram, oregano and verbena, are used abundantly. Here, for my taste the tea is too sweet, but even if served without sugar, the local spearmint has natural sweetness that compliments the Chinese gunpowder so well that one cannot stop sipping. Brewed in a pear shaped four-legged brass or silver teapot and served in tall glasses, the tea is poured from high above to create a froth on the surface. Try yourself, but I assure you that everyone spills, the local waiters confessed. The pricier saffron tea is more common in Taliouine, where the rare spice is grown. Sugar is grown, exported and used in abundance, since honey often sweetens pastry. Dates like the Berber varietal that is less sweet than the succulent Medjol and other Middle-eastern imports. 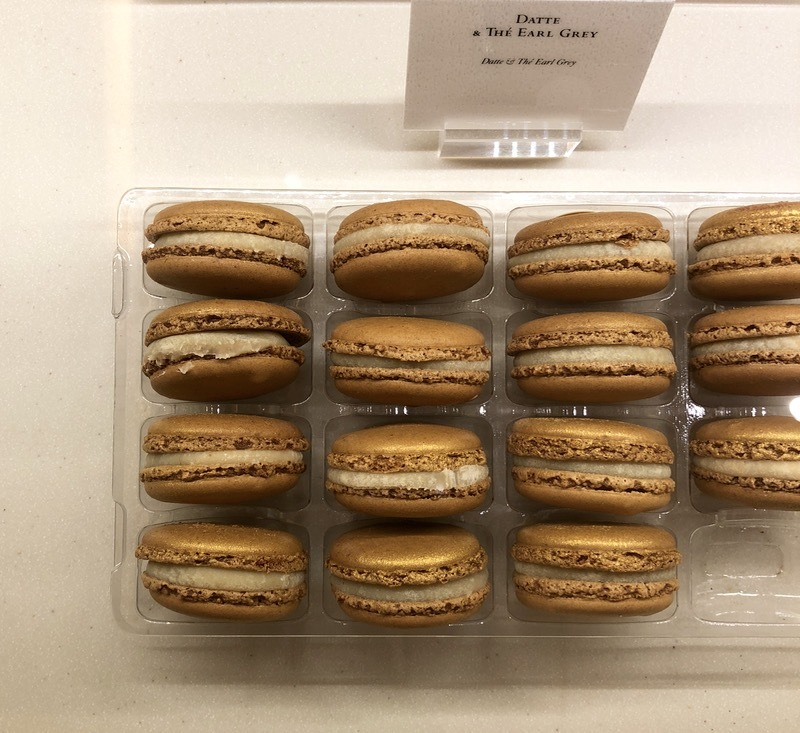 Dates have inspired even foreign pastry masters like Pierre Herme, who created an exclusive date & Earl Grey tea macaroon for his indulgent boutique inside La Mamounia. 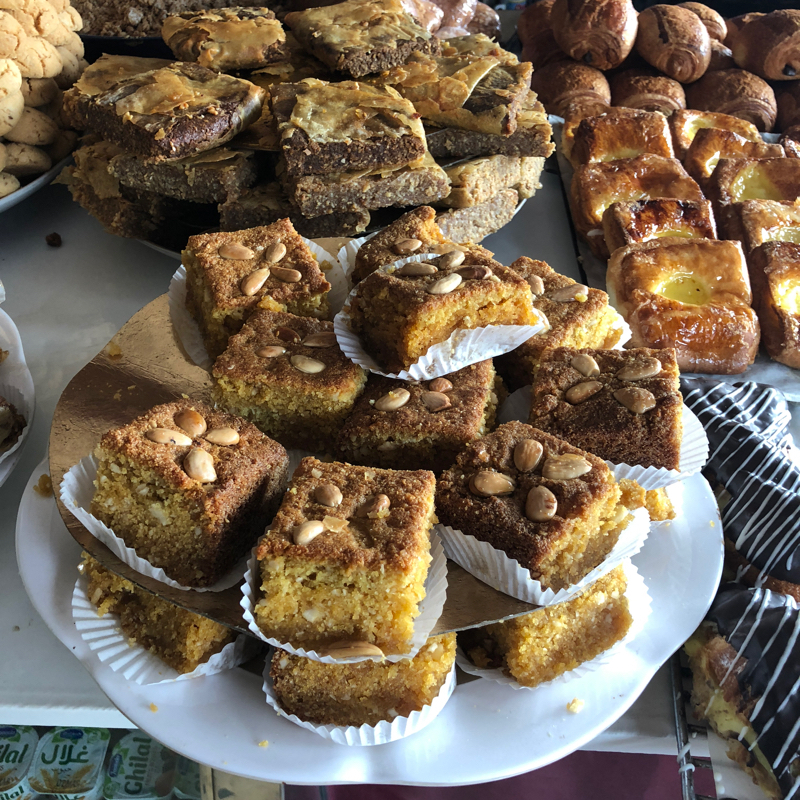 With the influx of the French, croissants, pain au chocolate and other pastries next to the domesticated Arabic sweets entered the local cafés. At tearooms the rich honey and nut-based pastries such as orange scented cookies, the nut paste filled horn-shaped pastry (hence the name) Corne de Gazelle, honey-sesame chebakia popular during Ramadan, are ramped up sweet. Street food like harira (tomato and lentil soup), grilled merguez sausage, shish kebab, roasted chickpeas, flatbreads, nutty sweets, and fresh fruits like pomegranates, bananas, tangerines, and other seasonal bounty fill the jammed roads around the medina, yet the epicentre of cheap food is the Place Jemaa el Fna. This wide main square is packed with stalls offering anything from fresh orange juice to dried fruits and nuts. During Ramadan, after the muezzin announces sunset the locals flood in to savour the cumin spiced snails, sweet treats like shebakkia and other festive highlights of the Moroccan cuisine. Like in most African countries, the Moroccans eat with their hands. Usually, using the thumb and first two fingers of their right hands. Warm towels are usually served at restaurants before the meal. Ironically, the only time I ate something else than a sandwich or a cone of gelato with my hands was at an Ethiopian restaurant in Italy. As in Morocco, we used the bread like a spoon soaking up the sauces of the stews. At nice restaurants silverware is now commonly used. Morocco produces all the food it needs. Fruits like figs, dates, lemons, oranges, melons, vegetables like tomatoes, potatoes, sweet and hot peppers, olives, but also sugar cane, wheat and almonds. Avocados inspired decadent recipes, but the avocado milkshake or a smoothie are the most lips-licking treats. 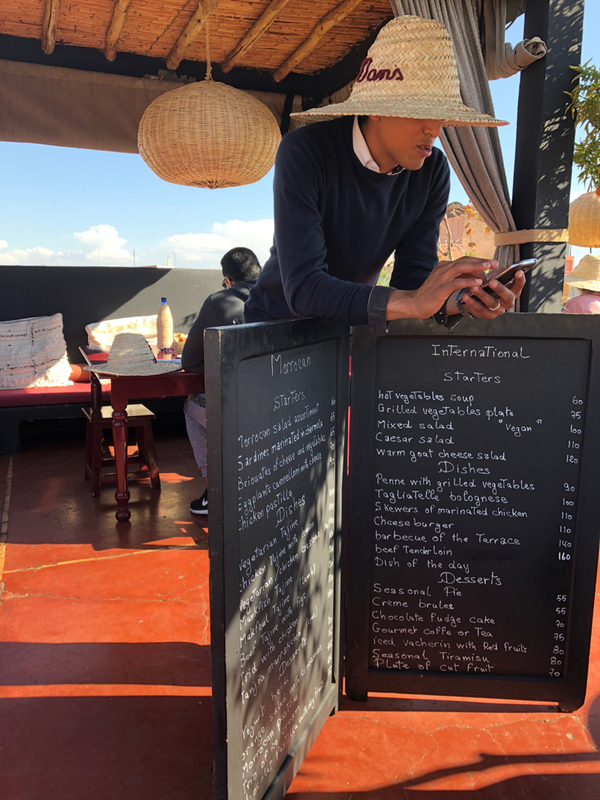 In the cultural hub of Morocco tradition claps to the millennial preferences as many restaurants in Marrakech are self-sustaining, sourcing either from their backyard or their own farms in the countryside. 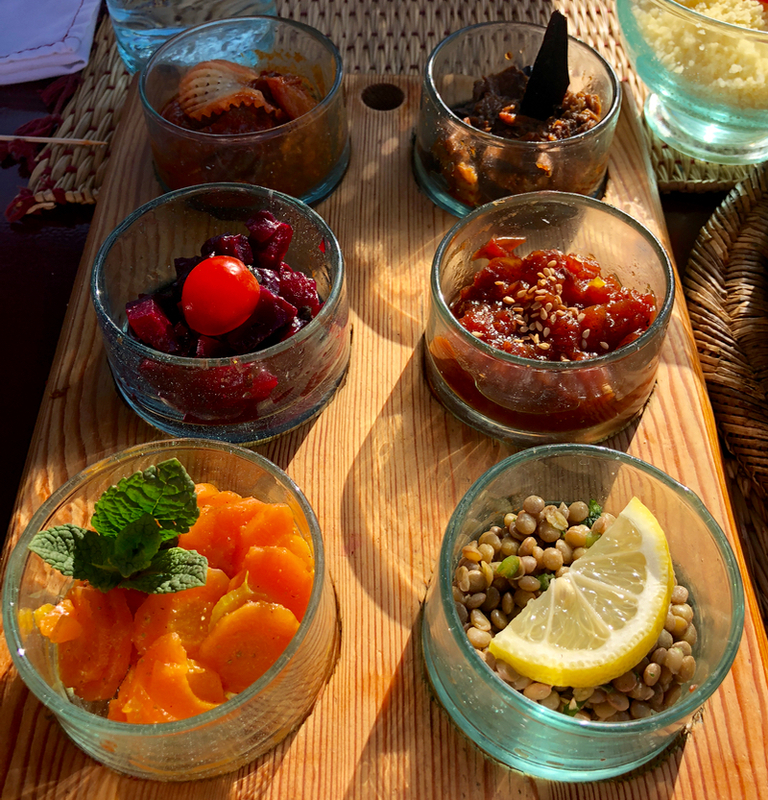 For cool vibe and contemporary presentation of Moroccan food with bountiful international inserts for the jet-setting mouths head to the sunny rooftop to Terrace des Epices in the western part of the medina. Straw hats are provided to shield you from the rays, Dj spins the tunes, and the cooking is superb. It’s touristy, but well-run as a lunch and dinner lounge. I recommend the Moroccan salads, the tajine if you have not had yet enough, the peppered olives and flatbread served perfectly warm. Not far is its sister design restaurant Le Jardin, where also Moroccan cuisine meets international hotshots. Good enough to try. 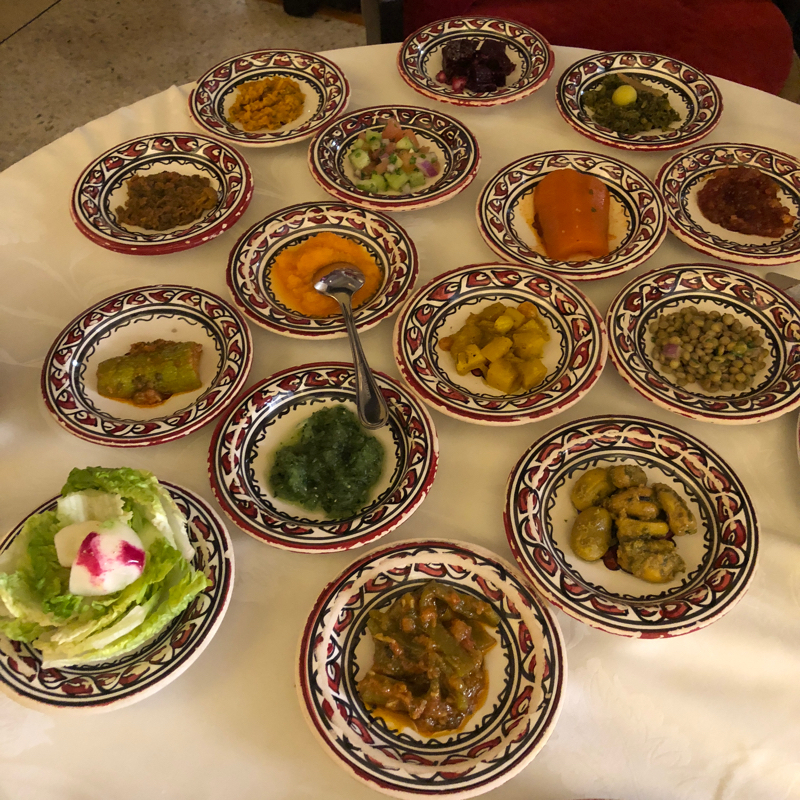 Al-Fassia, are now two restaurants run by two sisters from Fez employing only women, offer superb food, but the service at the older restaurant in the Gueliz can be flaky. 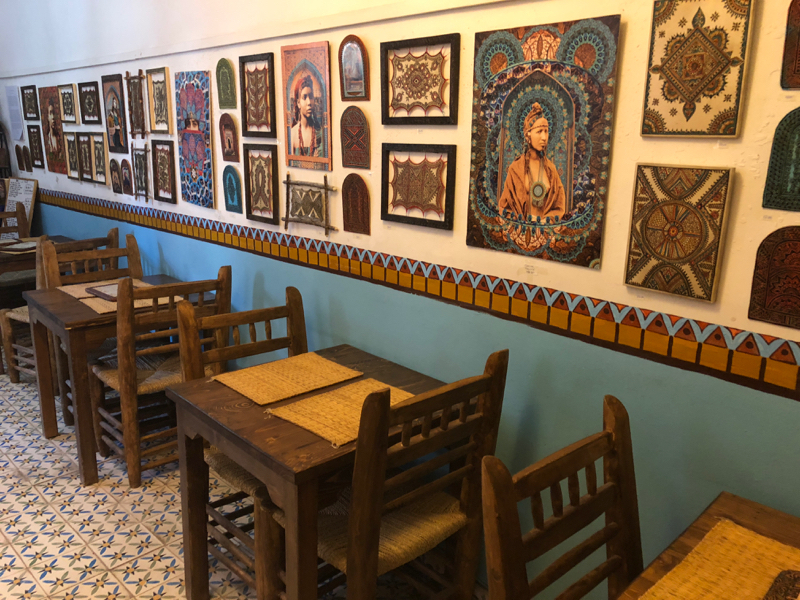 For an artistic boho feel the ingredient-driven lunch at the ultra-casual Henna Cafe is enjoyable for a shaded rooftop break in the souks. Do not bother eating at the Moroccan restaurant of the luxurious Selman hotel. Along with the Chinese fare at Lily run by the fancy Mandarin Oriental, these were the worst meals of our trip. At La Maison Arabe, the oud string music also does not compensate for the average, touristy cooking. It is a visually beautiful place to stay, and Churchill lodged there when he did not luxuriate at La Mamounia. 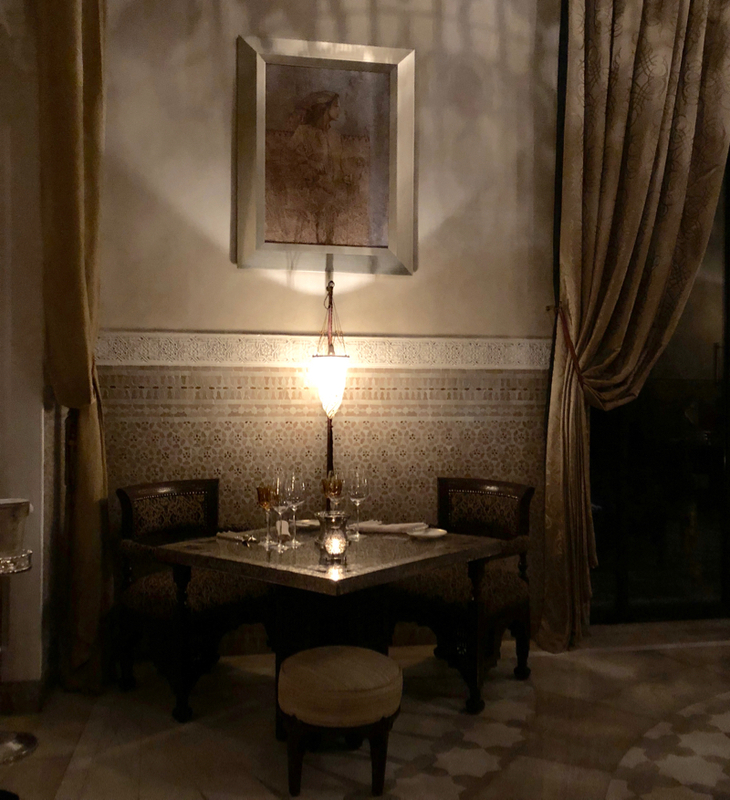 Unless you care only about the atmosphere and sartorial history skip Dar Moha at the former residence of the French couturier Pierre Belmain, the chef vainly attempts to bring Moroccan cuisine to the 21st century. At the palatial La Mamounia hotel pre-dinner cocktails are sipped at the swish jazz lounge, an easy-going buffet brunch is served by the pool (go for the cold plates, order the warm dishes since the buffet offerings limp behind), and cigars are puffed at the Churchill bar or on benches drizzled all over the leafy garden. Inside the vast “jardin” there is a sizeable vegetables and herbs patch supplying partially La Mamounia’s four restaurants (the Italian is so so). From chicory, purple artichoke, carrot, fennel, pak choi, tomatoes to various types of mint, parsley, to the flowering nasturtium, even goji berries (well they dried out) and stevia. 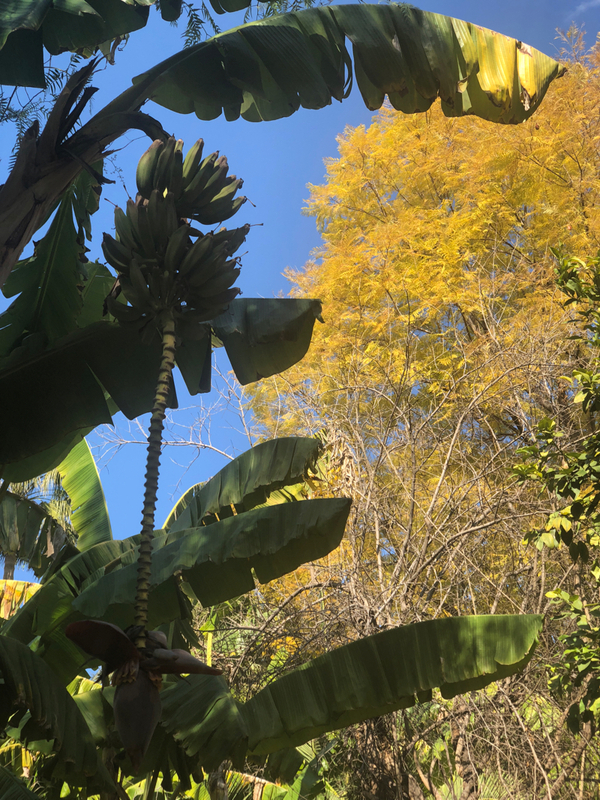 Lemons, tangerines, oranges and bananas ripen in the orchards. Donkeys help the gardeners to transport the seedlings. The more rustic and authentically intimate, while still luxurious Jnane Tamsna hotel also sources much of its plant produce from the gardens surrounding the property. Set away in the lush Palmeraie outskirts, during pleasant temperate days dine by the garden pool as it is meditatively quiet. 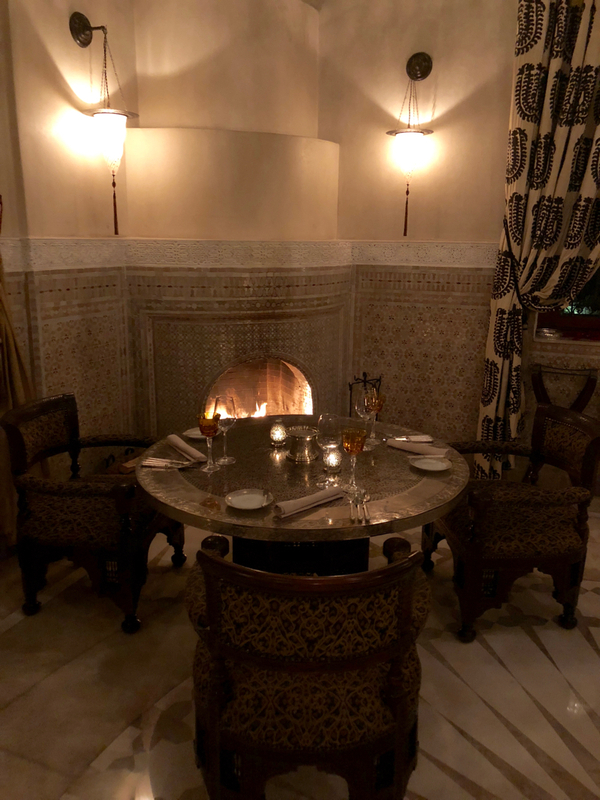 By far the best Moroccan food in town is at Le Grand Table Morrocaine at Le Royal Mansour hotel (referring to the “Victorious” Moroccan sultan Ahmed el-Mansour). Owned by the current king, the menu is overseen by the French, multi-starred chef Yannick Alleno, who apprenticed with Moroccan lady cooks prior to the opening. His skilful refinement of the Moroccan cuisine is evident. 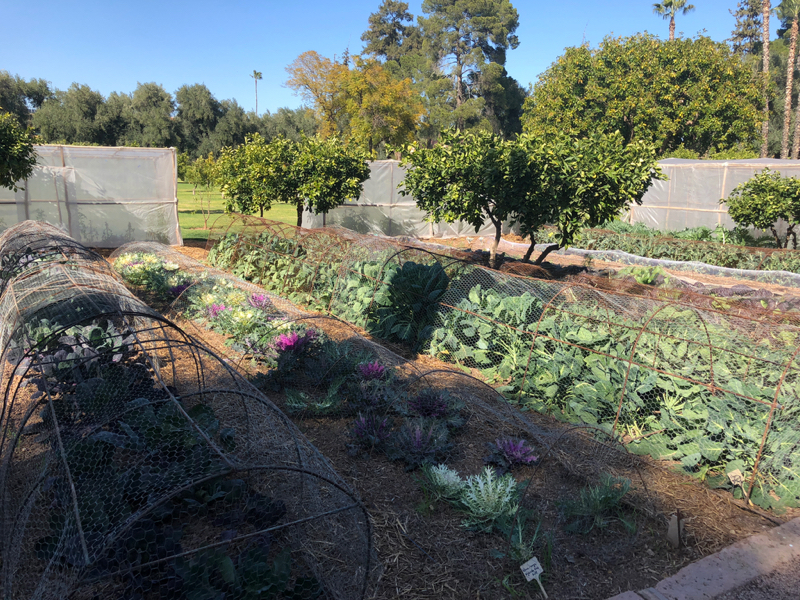 The produce comes from the hotel’s own farm just outside of the city. Nest under the spell of the oud musician by the fireplace and allow the magnetising art and high local craft pull you into the dining oasis. 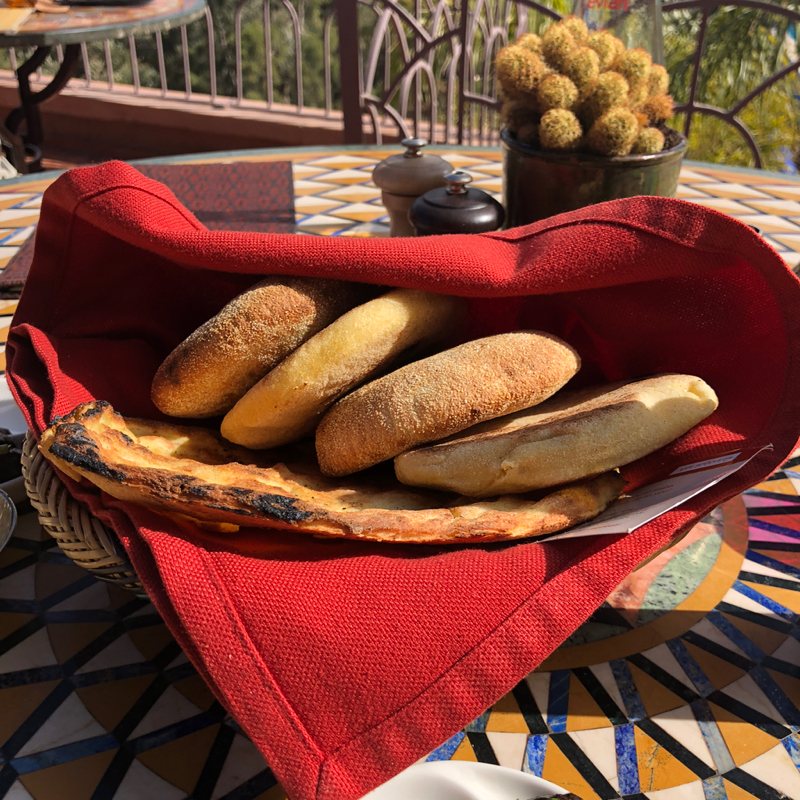 I am not an expert on Moroccan cuisine like Paula Wolfer, the American cookbook author who lived in the country during its bohemian heyday, but in today’s sedentary lifestyle setting I long for a more updated, lighter and creative Moroccan cuisine. 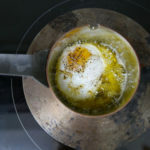 For a couple of days the local rich traditional cooking is enjoyable, but soon one craves an intrepid chef with a penchant for this Western horn of Africa to spell his millennial magic on the Moroccan cuisine. Perhaps because of the widespread poverty and the tourists seeking the “authentic” experience when visiting, there was so far not enough space for experimenting inside the country, but the tide is changing. Across the Atlantic and further over on the West Coast of America in San Francisco, the Moroccan chef Mourad Lahlou is updating his mother’s culinary heritage at Aziza restaurant (his mother’s name). He shares his vision for contemporary Moroccan cuisine with the world through his book, Mourad: New Moroccan (published by Artisan). The Wall Street Journal recently reported that the future of contemporary Moroccan cuisine in its home country is female. From the cultural shift to empowering women in Morocco there is space for the next Moroccan grand lady chef. The country’s own Master Chef Tv series highlight the new local talent. 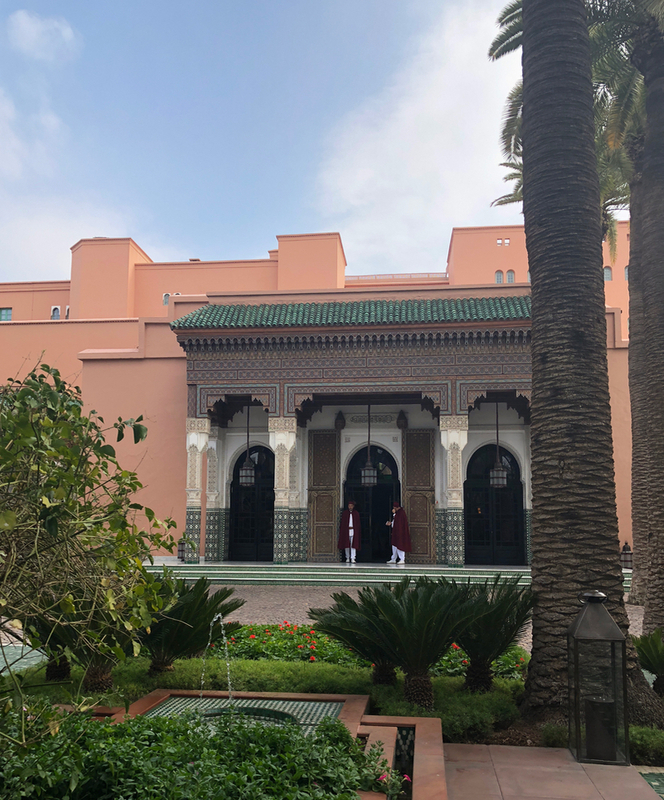 In Marrakech at Salt, guest chefs play with Moroccan ingredients in a new way, while in Fez chef Najat Kaanache with a pedigree spanning El Bulli and Fat Duck stirs the palates to new dimensions. Besseha! بالصحة Bon apetit!